This house stands on the site of one of the three houses owned by Benjamin West (see No. 38) and was in the same ownership as No. 38 throughout the 18th century. 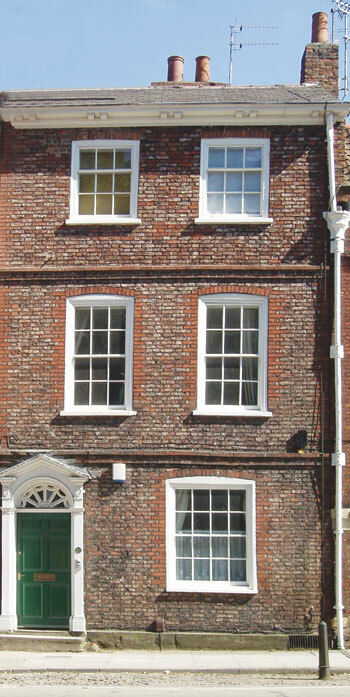 The original building was of the second quarter of the 18th century, although the timber doorcase to the entrance and the eaves cornice are early 19th century. The space between No. 40 and No. 38 was originally a carriageway to the rear of the properties but at a later date the ground floor formed an extension of No. 40, with the flying freehold above being part of No. 38. The house is of three storeys of mottled brown brick with red dressings. It has single front and back rooms with the staircase placed transversely between them and a small projecting wing at the back. The staircase has open strings and turned balusters with square knops and the first floor windows have been lengthened. The Trust purchased this property on 25 July 2005 in order to protect the flying freehold of No. 38. The property has been sympathetically converted into a one bedroom ground floor flat, and a two bedroom first and second floor flat.